I will be making as many Regional BBQ Sauces as I have time to test. I made my version of Eastern North Carolina Vinegar and Heat Sauce last night, and tried it out with the wife and kids. I salted and peppered 3 racks of ribs, and smoked them for 3 hours at 250 and then raised the temp to about 375 for an hour or so. We just splashed the Eastern North Carolina Vinegar and Heat Sauce on the ribs at the table. It cut the grease and was simply great. Nobody touched the KC Masterpiece sauce, so they either liked the homemade sauce or were being nice to me. NorCal Ovenworks sells a kit for a masonry parrilla just like those made in Argentina. Many of our customers share the final photograph of their parrilla with us. Too many for us to post all of them. This particular parrilla, located in Southern California merits special mention. This is the most refined example of a parrilla that I have seen. Labels: A Parrilla made using our Argentine Grill Kit. 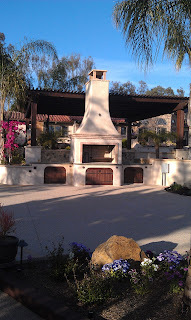 Build an awesome outdoor kitchen using flexible modular components from NorCal Ovenworks. Start small and grow your outdoor kitchen as finances allow, or drop a fully configured outdoor kitchen into your new multi-million dollar home. It's that flexible! Modular Component 1 is the single component width wood/charcoal firebox, stand, fuel drawer, grill, and door. Slide in any of our gas burner drawers to convert to propane of natural gas. Add a front door, back panel, and side panels and have a complete outdoor kitchen that grows or morphs as your needs change. Modular Component 2 is the double component width version of Modular Component 1. In this case, we are lining our outdoor kitchen components up on the pool deck. Swim all you want, and then dry yourself off next to the smoker, or the grill, or the pizza oven, no by the wok....Oh, it gets so confusing!